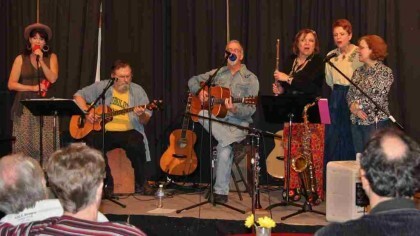 Music is an integral part of ministry at UUMAN. The music program, led by director Huu Mai and accompanist Alex Pietsch, includes an adult Chalice Choir, a multigenerational Family Choir, various instrumentalists, small group singing, and vocal and instrumental soloists. UUMAN is a “singing congregation” – choirs and congregation members alike share a joy in singing together as part of our worship experience. Special music adds to the richness of our services, including a multigenerational pageant and candlelight service at Christmas. UUMAN’s involvement in music throughout the community has grown in recent years. Common Grounds, our coffee house, founded in 2012 by choir member Janet Lacey, now brings local performers, Roswell residents and our congregation members together one Saturday evening a month for music, poetry, and fellowship. Every February since 2011, as part of the largest Black History celebration in Georgia, the Chalice Choir joins with choirs from across the city, sharing the exuberance of singing together in a Unity Concert. 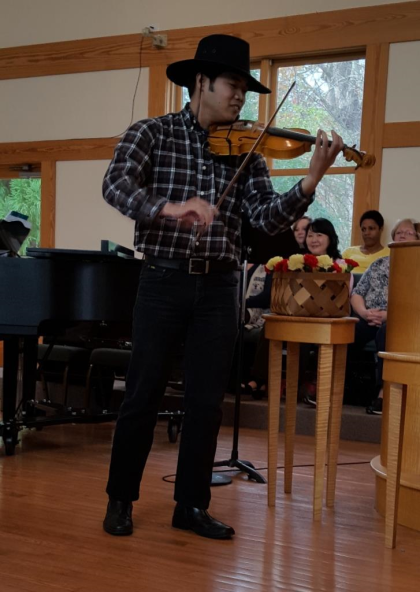 Our community outreach continued this past November when Music Director Huu Mai, was invited by the composer to conduct “Shanti: A Journey of Peace.” Written by KanniksKannikeswaran. “Shanti” is an oratorio based on Indian ragas which combines singers from western choirs with those from the Indian American diaspora. Sixteen of UUMAN’s Chalice Choir members performed “Shanti” with dancers, professional western and Indian musicians, and artistic imagery to a full house at Georgia Tech’s Ferst Center. UUMAN’s music ministry has matured and grown considerably over our twenty-five-year history. Initially small, the Chalice Choir now boasts about thirty members. Led from 1997 until 2003 by beloved founder, Amby Holford, the choir and musical offerings continued to strengthen under Gay Grooms, Randy Wilbur, and, since 2011, current director Huu Mai. Congregation members Lois and Larry Curry gifted UUMAN with a Yamaha baby grand piano in Huu’s honor in 2011, increasing our musical capabilities considerably. UUMAN is fortunate to have Huu Mai and longtime accompanist and accomplished pianist Alex Pietsch as leaders of our music program. 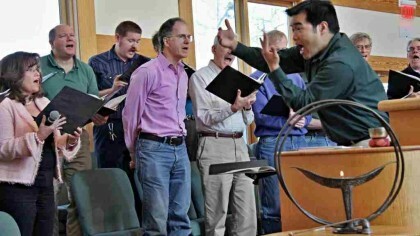 Huu’s philosophy is to accept every single person who wants to sing in the choir. His vocal techniques and his education allow him to simply state, “Everyone can actually sing.” He is extremely versatile, talented, and nurturing in his role as music director. In addition, he is a virtuoso pianist and violinist, talents the congregation has enjoyed in his years with us.